WD3 Wargames Directory 3.4 • View topic - Differential Flanking Modifiers? Hear me out - it's not as dull as it sounds. But... it occurs to me that the consequences of being flanked are vastly different for different units, and that most rulesets do not reflect this. If you pop out of the bushes behind infantry in firing line... it's no great hardship for them to about face and brass you up. +1 for flanking while they give orders and shuffle around. If you pop out of the bushes behind cavalry... depends on their reaction. If they want to move away - not much of a problem. If they want to turn and fight, it's harder for them than for the infantry in the first example. Artillery? Potentially devastating. Flanking artillery means coming into contact with their limbers or their ammo carriers - elements with little ability to resist an attack, but their loss renders the battery useless. Maybe there should be a higher bonus for flanking artillery. Kindly assist me in forming a coherent principle from these ramblings! Hmmm. Norm, my first thought was that whilst you have a valid point, I think in terms of my gaming, it may be unduly complicated to add extra factors to outflanking. I also thought that the element of surprise might render such differences with even more random impact. That is: phlegmatic artillery crew fight like tigers whilst jittery Line infantry simply bolt. So.....dice. My suggestion, for what it's worth, is have a simple table with 3 (?) outcomes on being outflanked & throw a dice to determine which to apply. I'm thinking that would be too much granularity for me- an extra complication that wouldn't really add anything to the game in terms of decision making. I'd let the usual dice rolling for victim morale to factor in that kind of eventuality. Anything more than a +/-1, such as introducing an additional table to be consulted, really isn't bringing much to the party. That said, I'm more outcome- than process-oriented in my wargaming, so your mileage may vary. An about face (to the rear) was incredibly difficult in the Seven Years War. I know what you are thinking, you are thinking "No it's not, each man just does a 180 degree turn on the spot, job done!" Alas, it was not that simple. You see, each man had his place in the line, best, biggest and sometimes best looking men in the front rank to provide solidity in the face of the enemy (and something for the ladies to look at when on parade), so just turning men about would have the the rear rank - the worst men - facing front. As panic generally spreads front to back this is not a good thing. Also, each platoon and company had its place in the line and this was very important for sequenced platoon fire. Simply reversing everything caused disorientation when fire came from the wrong side, seemingly 'out of sequence', and this threw everyone into utter confusion very quickly. I can't emphasise enough how important being in the right place is to soldiers in rigidly organised units: All of the individual soldier's training is based on his simple placement and orientation in his bit of the line. So to about face, companies and platoons would have to march to their new correct place in the line, so that each man was in his correct place (grenadiers always on the right with the numbered companies in their correct sequence running off to the left, if you will). In short, an about face took ages and, if under fire, was actually almost impossible to achieve: fortunately such disastrous surprise instances were rare. They were much rarer on the field of battle than they are on the tabletop. There are cases where the rear rank was ordered to face about - so that the formation was effectively facing in two directions at once, but firepower was much reduced and the units that successfully pulled it off were generally lauded as exceptional. A Prussian unit (the Liebgarde) did it at Kolin when fighting off Austrian dragoons. Famously, there was a British Napoleonic unit that did it in Egypt (I think) and was allowed to wear two shako plates (one on the front and one on the back) afterwards. You are right, of course, in saying that incoming fire doesn't kill more men. It's the morale impact of fire coming from a direction no one was expecting that is important. The impact is quite substantial and units often dissolved immediately it happened, with only the best ones having the solidity to take the fire then do something about it. All flanking fire was very bad on a large 'formed' unit because it took so long to wheel about to present a new front, being fired at all the time without being able to reply, and with the emergency causing panic and confusion to officers and men alike: because everyone had to act, all at the same time, and in an organised fashion. It isn't hard to understand why most units crumbled to a shambles and broke in such circumstances. In wargaming terms, plus factors to fire followed by a reaction test of some sort is probably best. 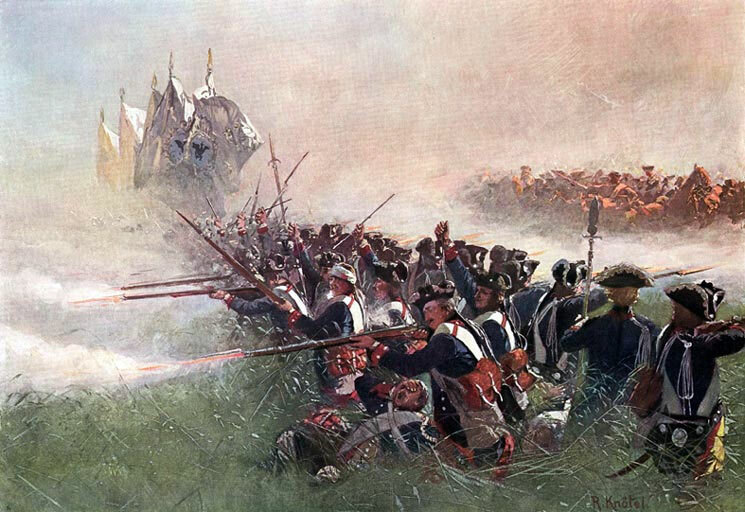 In general, flanking and rear fire Vs rigidly organised units should be quite devastating - historically, that's the main reason why armies generally formed up in a line that matched the enemy's line. If your army has more men you might have a reserve to plug gaps or add a maneouvre element to your battle plan. Gaps in the line that the enemy can exploit are generally bad on the battlefield and on the wargames table: Get there fastest with the mostest, create a gap, then exploit it. Isn't that the essence of field battles - doing it, or defending against it, or both. If you down play flanks I think it detracts from the tactical objective. Last edited by olicana on Wed Jul 19, 2017 9:32 am, edited 5 times in total. That's quality info - everyday's a school day round here! Jim - You are correct, but be aware that the British started by-passing the idea of seniority during their excursions to North America, a bit during the F&I War, but primarily during the AWI. During the latter conflict, it became standard practice for units to form with the most senior company on the left or right, or even in the centre if circumstances demanded it. I must confess to being unclear as to how easily this travelled through the French Revolution and into the Napoleonic period, but quite a few memoirs from the Peninsula refer to units coming into action "any old how" and in no particular order, so presumably this was re-introduced at the same time as greater individuality in the ranks was encouraged - and not just among light troops, but among the general rank-and-file as well. Yep, that's the Leibgarde facing both ways at Kolin. Such a famous incident someone painted a picture of it. They're being very inconsiderate with those muskets. They've woken up that chap who was sleeping off his hangover, look.